Our flagship pedal that started it all... The Marshall in a box that renders brilliant, smooth, tight and responsive overdrive/distortion tones for days. An original design. 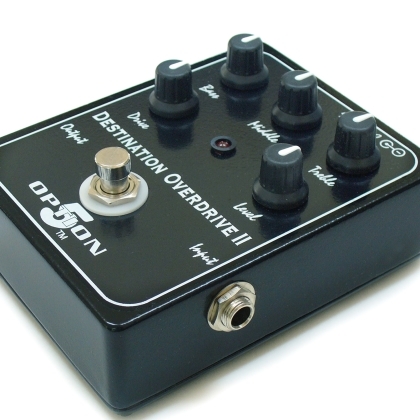 This pedal adds another channel to your amp with a classic tone stack configuration. From a barely broken up blues tone to a rip your head off searing, scooped mids heavy metal tone, this is one pedal that has a range that is usable throughout. Jay has designed it that way. The bass is never farty. Performing a dive bomb will not make it choke. Roll guitar volume knob back and reduce gain. Plays well with other pedals. Picking dynamics and note separation are unbelievable. And, oh yeah, its also low noise! Usable-throughout gain control with unheard-of range.